History: 16 year old female with knee pain. 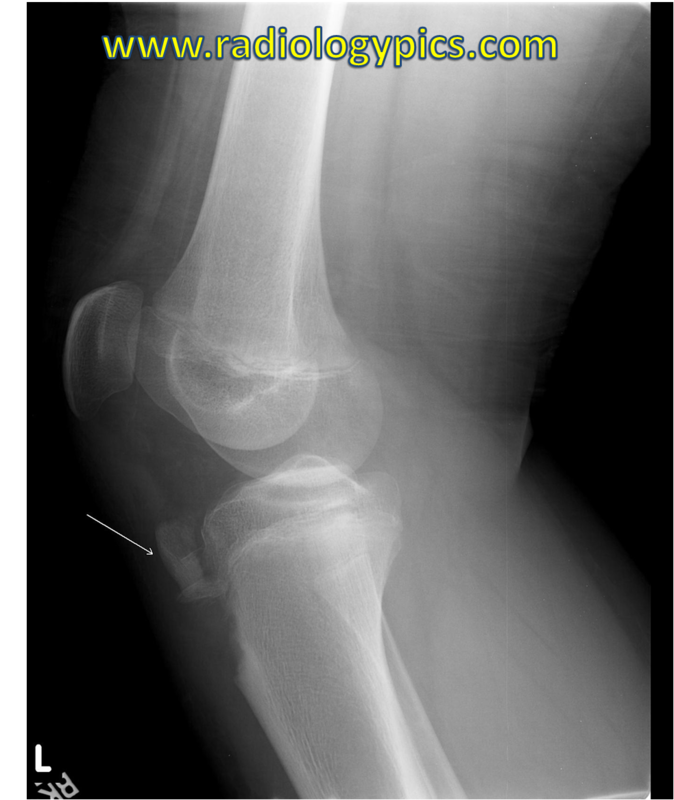 Tibial Tubercle Avulsion Fracture: Lateral radiograph of the knee reveals a free fragment of bone anterior to the tibia (arrow) compatible with an avulsion fracture of the tibial tubercle. The patella may also be slightly high riding in this image. This is the appearance of an avulsion fracture of the tibial tubercle, which occurs when the patellar tendon pulls a piece of bone off of the tibia. This is an acute injury where the apophyseal ossification center becomes displaced, as opposed to chronic repetitive stress injuries at the apophyses which cause bony irregularities without separation of bone fragments. The chronic injury to the tibial tubercle is called Osgood-Schlatter syndrome. Avulsion fractures of the tibial tubercle (tibial tuberosity) typically occur between the ages of 12 and 16, and happen while playing a sport such as basketball. See an avulsion fracture of the anterior superior iliac spine here.